While these experiences can be frustrating, even rage inducing, there is a tool you can use for a bit of catharsis: @HowsMyDrivingDC. Tweet any license plate at this seven-month old Twitter bot, and it will return all the vehicle’s outstanding parking and speed camera citations in DC. Daniel Schep, a software engineer and Transportation Techies hack night MVP, developed @HowsMyDrivingDC when he observed some in the #bikeDC community were taking photos of dangerous driving behavior, then manually looking up the plate on the DC DMV website and tweeting the violation and outstanding citations side-by-side. Schep pursued an automated solution, just to see if it could be done, and a week later, @HowsMyDrivingDC was born! Which state’s drivers are most dangerous? According to Schep, whenever @HowsMyDrivingDC comes up in conversation, the first question is always: which state has the most tweets and citations? Now that the bot is seven months old, Schep provided me with recent underlying data, so I could try to answer that question. As shown in the table above, Maryland vehicles represent over half of the overall citation value logged by the app, and are virtually tied with DC vehicles for total tweets. Since there is no reciprocity between DC, Maryland, and Virginia DMVs, there is much less incentive for Maryland and Virginia drivers to pay their outstanding citations. The lack of incentive for out-of-state drivers to pay citations is highlighted further when looking at the age of citations. Regardless of state, approximately a third of all citations not being adjudicated are at least 60 days old. However, one in five citations issued to Maryland vehicles is at least a year old, while DC and Virginia vehicles have a low percentage, 6% and 3%, respectively, for citations of the same vintage. This trend in the Twitter bot data is consistent with a report out today from WTOP showing that of the $324 million in citations issued in DC in FY2018, $139 million remain unpaid. Maryland vehicles account for 43% of these unpaid tickets. After conducting a similar analysis last fall, Schep and I decided to develop a mobile app version of @HowsMyDrivingDC and enter into the DC Office of Chief Technology Officer GigabitDCx competition for a chance to win funding. We were selected as one of six finalists and dove headfirst into developing the How’s My Driving app. The primary purpose of the app is to harness the collective power of pedestrians, cyclists, and scootists to capture the dangerous driving behavior that affects them the most. Our ultimate goal is to leverage the app for targeted, real-time enforcement to get the most dangerous drivers off the road. 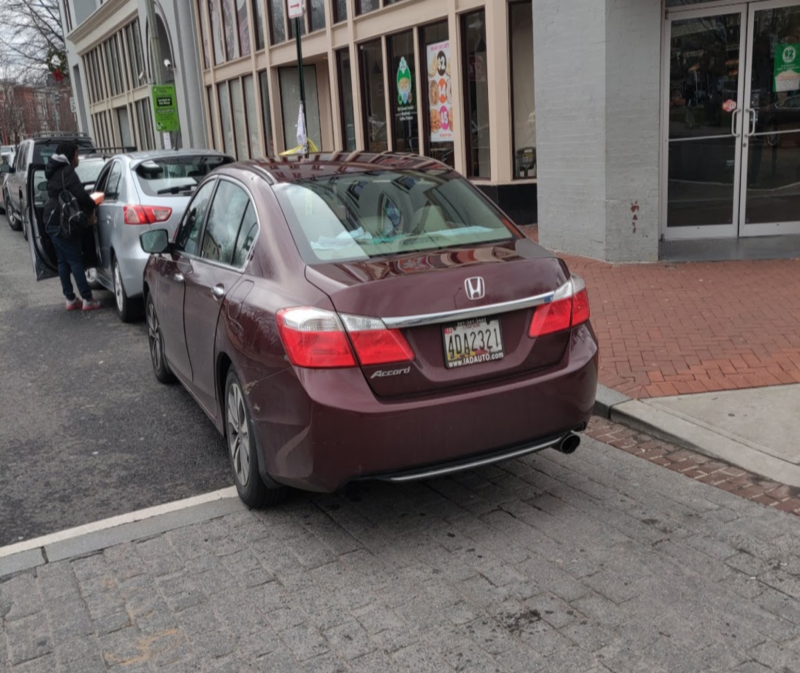 Let’s say you come across this vehicle blocking a crosswalk in Barracks Row…. Snap a photo, tap the plate state, enter the plate number, tap the vehicle status, choose the violation type and submit. Once your violation is submitted, a summary page shows that this vehicle has six outstanding citations totalling over $1,000. Since at least two tickets are over 60 days past due, the vehicle is eligible for tow. This vehicle’s most frequent violations are for speeding, indicating a pattern of dangerous driving. Department of For-Hire Vehicles (DFHV): DFHV is the DC department that has jurisdiction over taxis and to a lesser extent, ride-hailing vehicles like Uber and Lyft. Currently, complaints about such vehicles can be submitted to DFHV via phone or web form. DFHV collected more than 1,000 complaints last year, and fewer than 100 of them came through the form. Schep and I have been working with DFHV to ensure that violations reported through our app about taxis and ride-hailing vehicles are entered directly into their system. With more complaints submitted, DFHV can make the case for increased jurisdiction over ride-hailing vehicles such as mandating data sharing, implementing dynamic vehicle caps and suspending habitually dangerous drivers. 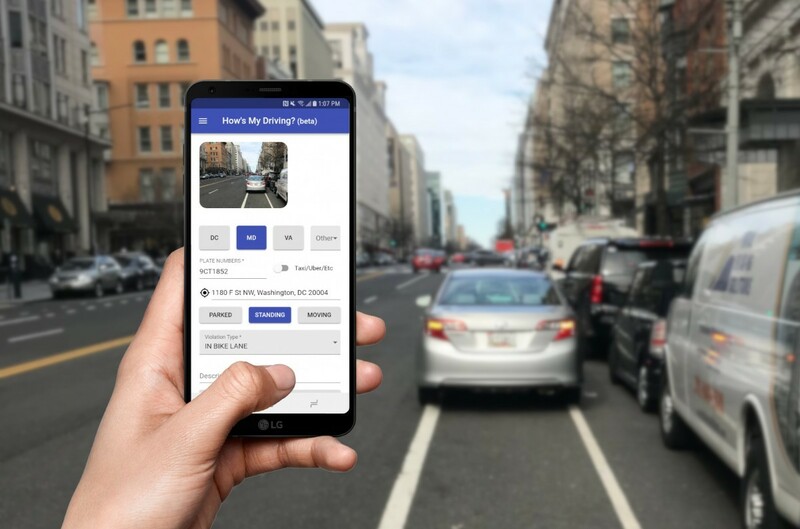 DC 311: Soon, when How’s My Driving app users submit a violation, parking enforcement requests and DC fleet vehicle complaints will automatically be reported to DC 311. This functionality layers onto our DFHV integration, meaning if a user reports a violation about an Uber, both DFHV and 311 will be notified. Alternatively, if a user reports a violation by a MPD vehicle, the complaint will only be reported to the Office of Risk Management via 311. Fun fact—only 300 such complaints were submitted via 311 last year. We hope this app will be an easy way to hold DC fleet vehicles accountable. DC Fleet vehicles should be the example of how to behave on our city street, not the exception. While integrating into existing DC enforcement infrastructure is great in the short term, DC’s enforcement mechanisms need a major overhaul in order to affect real change. Currently, DPW’s towing activity prioritizes emergency tows first, rush hour tows second, and 311 requests last. Rush hour tows will need to be deprioritized in favor of 311 requests in order to deploy the resources necessary to immobilize dangerous drivers. Additionally, parking enforcement dispatch via 311 will need to be re-imagined. Currently, all parking enforcement requests are considered equally and require a 311 employee to manually dispatch to DPW. We imagine a system where parking enforcement requests submitted through the app are prioritized and dispatched automatically based on the vehicle’s citation history and proximity to DPW parking enforcement agent. Using machine learning to automatically read license plates, the app will be able to verify the legitimacy of the request. The ultimate goal of the app is not to ticket and tow vehicles, but to act as a deterrent. If drivers know that anyone can snap a photo and log their dangerous behavior, they may think twice before breaking the law and putting other road users at risk. While these ideas may seem bold and far-fetched, that is exactly what we need to reach the city’s Vision Zero goals and make DC streets a safe place for everyone. And we already have some big believers in DC government. We were recently named runner up in the GigabitDCx competition and awarded $9,000 to continue developing our app. You can sign up here to join the beta test and help the How’s My Driving app become a force in DC!